PACLINE has been providing innovative and reliable conveyor solutions to a wide range of industries for over 35 years. Our conveyor equipment and components have been developed using the highest standards of quality and the results can be seen in factories and warehouses around the world. As part of our ongoing effort to ensure we provide the most effective engineered material handling solutions in every system we sell, we have expanded our permanent customer test facility at our head office location. This conveyor testing facility allows us to demonstrate our conveyor products to new customers not familiar with our equipment or to test unique set ups and carriers for handling specific products. By visiting our permanent test site, customers can get a first hand and up close look at how our conveyors work in handling their particular product and better understand how our conveyors may be utilized for their application. 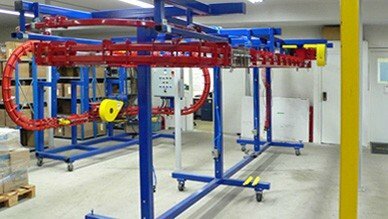 A small conveyor test loop can be set up at our facility or yours. This test loop may be used to demonstrate or test a unique configuration or specific part handling process or to help get internal buy off on the full system.